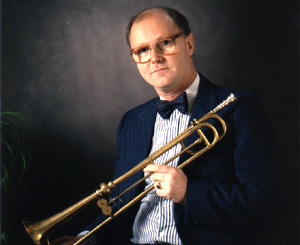 Introduction: Crispian Steele-Perkins ("CSP") is among the foremost modern practitioners of the 'natural' trumpet, and has played on countless recordings with all of the major period instrument orchestras. He no longer works for John Eliot Gardiner's English Baroque Soloists, and grew tired of having to fly all the time while he was the principal trumpeter in Ton Koopman's Amsterdam Baroque Orchestra. Yet he continues to regularly work with The King's Consort and Collegium Musicum 90. David Vickers ("DV") spoke to him about his interest in historical trumpets and performing Handel..
DV: Was Handel always part of your musical background? CSP: Almost my first public appearance was performing an arrangement for 2 trumpets of "The Lord is a Man of War" from Israel in Egypt in the music competitions at Marlborough College when I was aged 13. DV: And you have remained attracted to his music? CSP: Since his arrival in England in 1711 his music has ALWAYS remained popular. He writes marvellous tunes and equally marvellous bass lines to accompany them! DV: When did you start playing the trumpet, and how did your interest in natural trumpet develop? CSP: My brother Barry, 7 years older than I, played the trumpet in a Jazz band at Marlborough. During school holidays I borrowed his trumpet so much that our parents bought me one. I won the music competition Brass prize in my first term at school and joined the National Youth Orchestra of Great Britain. Nearly 3 years were spent at the Guildhall School of Music & Drama, then 6 months in the BBC Training Orchestra in Bristol - we called it the "Straining" orchestra. Thereafter, I spent 7 years in Sadler's Wells Opera, which later became English National Opera. This was where I first worked with Charles Mackerras in Handel operas. DV: Weren't you associated with some of the principal English modern instrument orchestras before period instruments started becoming more popular? CSP: I was a member of the English Chamber Orchestra (ECO) for a while, under Britten, Barenboim, etc., and also the Royal Philharmonic for 4 or 5 years. Then the "Early Music" scene kicked in, and I played for Gardiner, Pinnock, Hogwood, Parrott, Koopman, Hickox, you name it! I really enjoyed the change from "precious" music making and did my fair share of making THEM rich and famous!! I still greatly enjoy working for Robert King, Richard Hickox and Peter Seymour. DV: What particularly memorable performances of Handel's music have you taken part in? CSP: The 1985 Westminster Abbey Handel Tercentenary concert with Raymond Leppard and ECO was live on TV. I encountered the song "Eternal Source of Light Divine" for the first time here, and subsequently have made several recordings and innumerable renditions with James Bowman. But to play any Handel work in the Sheldonian Theatre in Oxford is very special, especially Athalia because Handel first performed it there. Haydn - another of my favorite composers - performed there too. CSP: In 1991 I did Messiah from Dublin Castle with Harry Christophers and "The Sixteen", and this was broadcast live on TV to celebrate 250 years since its composition. But my first wife had died only days before and my memory of the occasion is obliterated by other sadder ones. As for the future, the forthcoming Promenade Concert of "The Coronation of King George II" - devised between myself and Robert King - also promises to be memorable. DV: You've made a lot of recordings during your career. What kinds of trumpets have you used for these? CSP: Recording Messiah for Andrew Parrott using a Trumpet by John Harris dating from Handel's time was very important to me. The instrument was kindly loaned by the Bate Collection, Oxford, and belonged to the great 19th century player Thomas Harper Senior. Although it was modified in circa 1830 with a tuning slide, this trumpet has its original 18th century mouthpiece which is critically important for its distinctively "noble" tone; the excellent Bass singer was David Thomas. With the singer Jeni Bern, I recorded obligatti by Handel and Purcell using another genuinely early "English Slide-Trumpet". DV: This recording with Jeni Bern was with your own ensemble called The Handel Players. CSP: To perform and record with Jeni, I assembled a band of particular friends calling it "The Handel Players" for sheer convenience. Maybe this group should have gained a more permanent status? I don't relish the prospect of trying to organise musicians however much I enjoy their company. I see others tearing their hair out with frustration - I don't have any left to tear! DV: Do you ever get fed up with playing "The trumpet shall sound", or does it still give you a buzz every time? CSP: The aria "The Trumpet Shall Sound" STILL excites me. It is a climactic moment in Handel's best known work and in my opinion amounts to Handel's own personal testament of faith: " The trumpet shall sound and we shall be saved". The opening arpeggio figure is a fanfare played for centuries at the assize courts, usually performed by 2 trumpets in harmony, to announce the "Arrival of the Judge". Handel's audience would have understood the symbolism in the music relating to "Judgement" and "we shall be saved". So this is a very, very moving moment and needs to raise the spirit of the audience. This is not a moment for Ego, but for God! DV: How does it compare with the other famous trumpet and soprano oratorio aria, "Let the Bright Seraphim" in Samson? CSP: "Let the Bright Seraphim" is not perhaps such a definitive piece, but audiences love it - so let us be glad of any piece which enhances the trumpet's limited repertoire of "great" music. It requires great discipline to maintain high standards in music encountered so frequently, like performing a West End play for an actor. DV: As a trumpeter, I guess you haven't had an awful lot of jobs doing Handel operas. CSP: Yes, and Handel's operas are performed too infrequently - but they are a mine of material to an inveterate arranger and plunderer like myself! DV: But do you prefer performing in sacred or dramatic oratorios? CSP: The sacred oratorios give a solo trumpeter much greater scope, although some of the best like The Occasional Oratorio and the Dettingen Te Deum are inexplicably neglected. DV: Can you describe the kinds of trumpet you use for Handel performances, and how these may vary from those you might use for Purcell or Haydn? CSP: I use similar trumpets for Handel and Purcell, just as my antecedents did. But the instrument is differently used by each of them. For many years conductors and editors have tried to mask Purcell's music sound like Handel's. In my opinion, this is to miss the point. Purcell's orchestra was very small and the trumpets were played with extraordinary control and subtlety. Handel's forces were bigger, sometimes very, very much bigger, and the players needed great stamina and the ability to "project". This makes totally different demands upon the players; it is the way the trumpet is blown, not its dimensions that matter. I actually now own trumpets from the time when Haydn was in London; sadly, I have not found many conductors as enthusiastic about it as myself. Notable exceptions are Andrew Parrott, Peter Holman and - perhaps surprisingly - Richard Hickox. DV: Do you have any unfulfilled ambitions with Handel's music? CSP: My quest to do justice to Handel's music will always remain an unfulfilled ambition. If we could only hear his orchestra, I wonder if the shock would be a pleasing or a horrifying one?